The paramilitary police destroying the encampments and beating up and arresting those protesting in the streets against the egregious social injustices of our gov't also bulldozed the library at Zucotti Park. 5000 books trashed. I found an older blog (2006) wrote about my life in libraries and repost it here as a virus killed that blog and I never saved this except as a file in my computer. My earliest memories of libraries are vague but important to me. When I was around 8 or 9 my father took me to a very large library (so it seemed to me) in the Southeast Bronx. It was quite a walk from where we lived. We went at first to the children's library, but then my father said they didn't have books really for me, and we should try the adults. I remember climbing up a spiral staircase and coming out and being allowed to take out books on my father's card. I don't remember which books these were, but that I felt very proud to be in the adult section. My father did read aloud to me. R. L. Stevenson's "The Sire de Maltroit's Door" and "A Lodging for the Night" come to mind as such happy moments when he read them to me. Then when we lived in Kew Gardens, Queens, and I was 11 he came with me for a long walk and we went to an intermediate place. Not adult, not children's. Young adults. The building was not that big to my eyes, no stairwells. It was one big square building with the books on one floor (I thought so at the time). My father was anxious I should stop reading Nancy Drew and Bobbsey Twins and other formula books. He talked of "twins" books: the twins in this period of history and that. I remember taking out large tomes on Renaissance queens. I know I read one on Jeanne d'Albret. Years later I translated the poetry of two Renaissance women and nowadays research and write about early modern women. In our beginning is our end. My first research project happened when I was an undergraduate (age 19 or so). I decided for an art history course to do a paper on Delacroix's illustrations to a production of Hamlet. Why I happened on that topic I can't say. The teacher of the course (at Queens College, CUNY, probably told me these illustrations were in an art library in Manhattan on 53rd Street so I went there. I had to explain and explain and had a hard time getting in. But they did let me in and after a day or so, stopped hovering over me. I sat and looked at the illustrations. I wrote in sten about them in pencil on a sten pad. (I use Pitman sten.) I got an A+ on my paper and was excused from the final. No one gave me any instruction that I can recall. The experience at the art library on 53rd Street probably occurred in the middle 1960s as that's when I was at Queens College, CUNY. 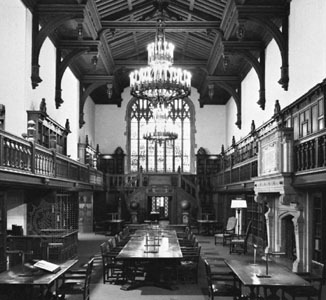 The next time I remember using a libary seriously for research was when I was at the Graduate Center of the City University of New York (I was 24-5). Our building was next door, and in return for our (the Graduate Center) giving the New York Public Library a stipend yearly (it was high; could it have been in the hundreds of thousands?, probably more in the tens) the graduate students were to have "special privileges." I did my dissertation on Samuel Richardson's Clarissa and Grandison and read rare books from the 18th century. I was allowed to keep them on a shelf near a carroll that was designated mine. I could leave notebooks there. The main change here is me: I am a graduate student working on a dissertation. I used the card catalogue though my that time there were large books one could use. They listed books alphabetically, but they were nowhere as complete and thorough as the card catalogue. I also did get some instruction on how to use the big bibliography books we used at the time. Now some of these are obsolete or they are online. I also didn't get much and it was inadequate and I remain ignorant and awkward in the use of the most basic tools of the profession. I use them catch-as-catch can, managing somehow without having been given a real solid grounding. I have saw many changes in the 1980s and 1990s. In the later 1980s I was living in Alexandra, a small suburban city just outside Washington, D.C. I wanted to do research again. I was probably 36-37 years old. Now I had the problem and fear I would not be accepted into a library. But I was told I could go just as a citizen if I had a legitimate project at the library. I got up my nerve and went in and told that I wanted to do research on 17th and 18th century English women and their memoirs and poetry. I was given a shelf and could work there; a year or so later I got a stack pass. Since the mid-1990s using online catalogues and a credit card I can buy microfilms and microfiche and xeroxes from the British Library, and I have done it several times. I have all the poetry of James Austen (brother to Jane), all the editions of the poetry of an 18th century poet, Charlotte Smith. In the early 1990s I could buy through the mails some microfilms if I could learn about them from catalogues in libraries. But often the libaries were not set up to send such things. .Now they can do xeroxes of rare books. For someone who hasn't much money, little time, and no connections this is a stunning important change. Late this spring I ordered two microfilms from the British for 2 papers I hoped to write on Anne Halkett’s memoir. As I’ve told you before (but you probably have forgotten) her years are 1621/3 to 1699 and she is thought to have written her memoir in 1677/78. The microfilms were of 1) a 1701 biography (The Life of Lady Halket by S. C.), which I was told was based on her manuscript before its opening, conclusion and two key spots were destroyed; and 2) some of her multitudinous meditations on religious texts (from the Bible mostly). When I returned from Buffalo where Izzy was at graduate school learning to be a librarian (getting a masters to enable her to get a job in a library or a job doing library kind of work) I really hoped the microfilms would have come; they hadn’t and on Tuesday I was still waiting for the precious documents. But Wednesday I began to admit I needed this text, and that more than 8 weeks had gone by since I ordered it. So I called a liaison for customer service at the British Library, a young woman whose phone (and I suppose) body is in Yorkshire, & discovered to my intense dismay the order had not even been sent. I had paid the sum in full, and at first it seemed that one had been made and left the library and been lost (over the Atlantic? ), and the other had never left the library. She also kept mixing the order numbers up. After a while she discovered neither order had been filled and promised she would chase the order down and get it out. I said I would call back on Friday. Still I wanted something beyond the secondary materials I had—though these are good. As far as I could tell from online sources the 1701 Life of Lady Halket was available at the British Library (and I could order a microfilm or xeroxes) and also at the Scottish National library in Edinburgh (where I couldn’t order any xeroxes or microfim). There seemed to be nothing at the Library of Congress but the 1875 book and Loftis. So I got up early today and off I went to the Folger and was so intensely cheered I could be said to have been transported. I brought along the information from the online catalogues and the librarian looked at me and said the online catalogue doesn’t quite represent what we have. We can’t afford those microfilms; we just record they exist. We have two books by Halkett. Real books printed in 1701. "I love it," said I, "I much prefer real books to microfilm readers." So I sit down at a desk in the older part of the library, and wait and there comes to me two books whose titles are Mediations and Prayers. I open up the first one and what do my eyes light ? a title page not reflected in the card catalogue, online catalogue or anywhere outside the book: The Life of Lady Halket by S. C., 1701. The biography. Right there. All 59 pages of it. It was bound by someone in 1703 as a preface in a book where 4 others of her books are to be found, all meditations. The title was Meditations and Prayers. Who knew? You couldn’t get that from the description Loftis offered probably because he read the book in a separate publication. The book in my hand was made up of 5 slender books bound together in 1702 or 3 by an owner and its title was how the owner saw it.. I also learned sheerly new information about Anne Halkett. All sorts. I’ve spent time in one research library in England: In the Brotherton in the 1970s in Leeds there was heat and you were in a round room. The Folger Shakespeare library in DC is one which is very comfortable and furnished beautifully. I love that it never changes. They still have a typewriter to type out new membership cards when you need to renew yours. The old card catalogue is not obsolete; it’s supplemented by the computer —whose entries are not to be trusted in the way of the card catalogue I now know (though the title of the book in the card catalogue is similarly misleading). Hardly anything changes at the Folger except they buy more Renaissance through early 18th century books :). I’ve not given up on getting a microfilm from the British Library, because it would be better to have the whole text not a handwritten copy. I can’t copy out every word :) I did as much as I could do today and will probably finish tomorrow. My sten and handwriting improved as the hours wore on. There really is nothing like primary research to reach what we are able to of reality. We cannot really get deeply into all the secrets these women kept to protect themselves, secrets whose burial in themselves destroyed them, but we can reach some. The main difference is in the use of microfilms, fiches and xeroxes I've just outlined. In the 1960s I had to copy out just about everything by hand and pencil. At first there were few xerox machines that I could xerox a page or so. In the later 1980s the Library of Congress bought many and I xeroxed whole books. I no longer do that as much because I can find books once hard to buy (because I could only buy what was local) and buy them on the Net literally from all over the world. In reality I buy from English speaking countries and buy mostly from the US; but I have bought from England, and Canada, less often from France, a few times from Italy and Australia, twice from Spain. And nowadays I do most of my work here on the Net; explore even rare materials because I have access to ECCO (rbooks published in the UK between 1700 and 1800). It's a loss of worlds even if convenient and a great saving of time and money and (as long as I hold onto my teaching job) gain in rich access. In resurrected this blog response to Daisy Fried's call for library poems on Wompo. I couldn't think of a library poem that satisfied me, so made a blog, a life in libraries. And nobody noticed, or raised an eyelash. Or maybe they were thinking of Juliana of Norwich. Aout to be trodden, and her shanks were smooth and sleek. Nobody paid any attention to this splendour . In silence and sweet temper, loving the world. It's too long for a comment. This book requests its author's absolution, centuries after his death. and a microchip. This other "book," the sky. 287. Shut Not Your Doors, &c.
Naomi Shihab Nye's "Because of Libraries We Can Say These Things"